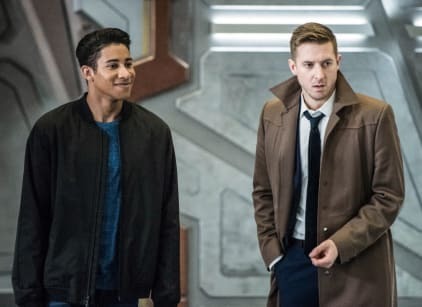 On DC's Legends of Tomorrow Season 3 Episode 13, after being kidnapped by Damien and Nora to help fix the broken fire totem, Ray is forced to accompany Nora on a mission to the past where they're facing a past version of her father: the assassin. While running from past-Damien and trying to stay alive (and keep his target alive), Ray and Nora bond, but Mallus' influence over Nora since she was a child has taken a toll and changed Nora into the cold, heartless woman she is today. However, Nora begins to turn against her father because he's so obsessed with power that he's always put her life below his need to be the best. Even then, Nora admits she only took Mallus in to revive Damien, which he didn't appreciate. There's clearly a lot of problems between the Darhks. Meanwhile, the team doesn't even know Ray is kidnapped until he sends them a message (after orders to do so from Damien). After finding out, Ava returns to the Time Bureau to use their resources to find Ray, but Rip's arrival throws everyone for a loop. And Wally struggles to figure out how to interact with the Legends and become part of the team.